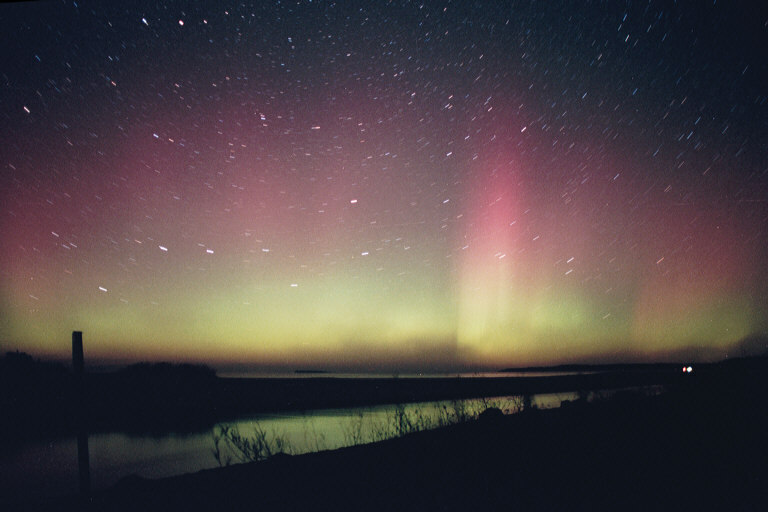 Taken around 1:00 AM EDT on 28 September 2000 from Platt River Point (Michigan). Ursa Major (the Big Dipper) is visible behind the aurora on the left hand side and Polaris is visible near the top edge of the frame as is Ursa Minor. 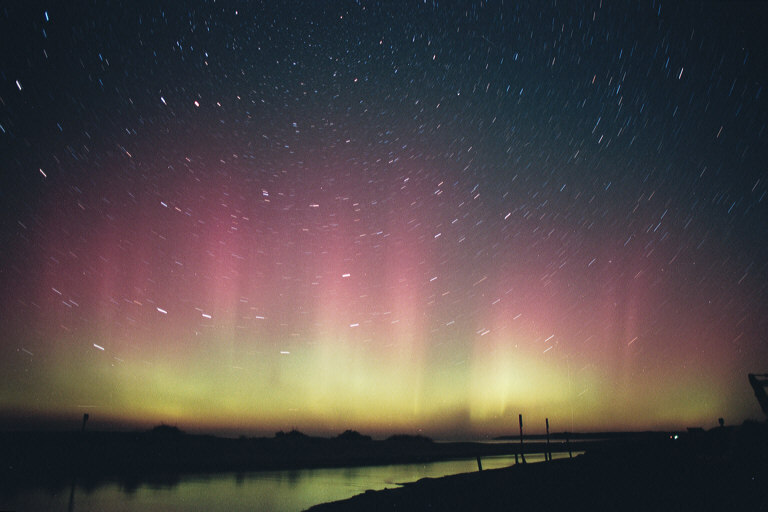 The aurora can be seen reflecting off the Platt River in the forground.This is around a 1 minute exposure on Kodak Supra 400 with a 24mm Sigma Lens stopped to f/5.6. 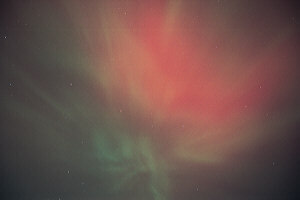 This reasonably close to the way the Aurora really looked that night (maybe just a little more color). Click the image for more info and access to larger formats. As above, but from a slightly different location on Platt River Point. The Platt River is visible in the forground. 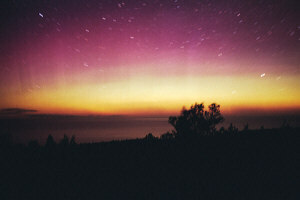 Lake Michigan Sounth Manitou Island and Sleeping Bear Dunes and visible against the backdrop of the aurora. This is maybe a 3 minute exposure with the same same camera and setup as above. Also as above, but from yet another location on Platt River Point. The Platt River is visible in the forground. Lake Michigan and Sleeping Bear Dunes and visible against the backdrop of the aurora. This is also a 3 minute exposure with the same same camera and setup as above. 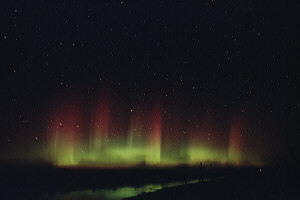 Actually taken before the above photos at 11:30 PM EDT on 27 September 2000 from Platt River Point. Ursa Major (the Big Dipper) is visible a liittle higher behind the aurora on the left hand side. 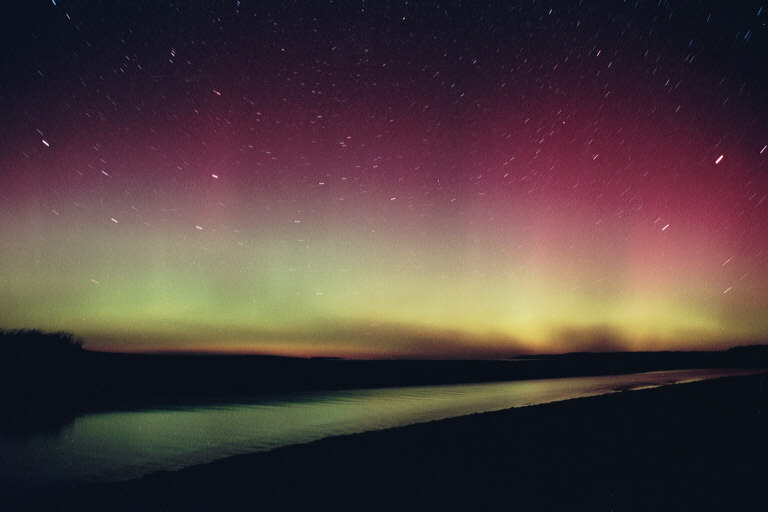 This one was maybe a 2 or 3 minute exposure on Kodak Supra 400 with my 24mm Sigma Lens stopped to f/5.6.